If you’ve ever considered starting a membership site on WordPress you’ll know there are dozens of tools to choose from. Although they vary in features, all membership plugins have one thing in common; content protection. The cornerstone of every membership plugin is the ability to show and hide content depending on who is viewing. This gives business owners the ability to charge for some content and give other parts away for free. When choosing which membership plugin to use it’s important to be aware that there is more than one approach to content protection. Many of the most popular membership plugins use a plan based approach to protecting content. Each plan is given a different name and when a customer checkouts they are assigned to whichever plan or plans are associated with that product. A growing number of membership plugins use a completely different method to protect content. This is due to the rise of ‘Marketing Automation’ platforms, such as ActiveCampaign, Infusionsoft, and Ontraport. Marketing Automation Platforms use ‘tags’ to organize and manage contacts. For example, everyone that purchases your product might be tagged ‘Customer’. By establishing a two-way communication channel between WordPress and a Marketing Automation tool, tags be used as the foundation of your content protection system. So, instead of using the plan based method, the plugin will first check which tags a user has to determine what content can be displayed. For example, if they have the ‘VIP Member’ tag they can view certain pages and posts but, without that tag, the content is hidden from view. This simple approach to managing content protection opens up a huge range of possibilities for membership site owners. The real power of using tags comes into play when one realizes they can be applied to a user in all sorts of scenarios, whereas a membership level is either given upon purchase or manually. Apply a tag when a customer clicks on a link in an email which then grants them access to a special offer page on your website. Apply a tag when a customer opens five emails which then grants them access to a ebook download. Apply a tag when a customer purchases a product which then grants them access to a course. Apply a tag when a subscribers lifetime value reaches $1000 which then grants them access to hidden products. Apply a tag when a customer purchases your membership product which then gives them access to members only content. But don’t be fooled. Even if a membership plugin lists a popular marketing automation tool as part of their integrations it does not necessarily mean they use tag-based protection. Memberpress, for example, connects directly to ActiveCampaign but merely adds new members to a particular ‘list’. It makes no difference which ‘tags’ they have. This is because it uses a membership level based approach. Until recently, plugins that used the tag based method were restricted to Infusionsoft as their Marketing Automation platform. But with increasing demand the variety of integrations has increased. One of the major players in this space is Memberium. Memberium mainly caters to the Infusionsoft market but also offers a version for ActiveCampaign. It has a rich feature set with dozens of configuration options available. Memberium also integrates with a handful of WordPress plugins allowing you to apply tags when certain events happen. With Memberium you can use both tags and membership levels (plans). However, levels are still are collection of tags along with a few special features such as login pages and roles. Memberium is not open source software and relies on IonCube technology to protect it’s source code. For the plugin to work correctly your web host must support a PHP extension called ionCube Loader. This means that you are locked into their platform and if you should ever decide to stop paying them, your membership site will stop functioning! With Memberium you can choose to accept payments directly through Infusionsoft or via WooCommerce. Since ActiveCampaign does not offer a built-in payment system this would mean using WooCommerce by default. This gives you much more freedom to use a marketing automation platform that is right for you. However, it doesn’t connect with any other WordPress plugins. AmbitionAlly is an “all in one” solution with its own order forms, LMS and gamification system. So, although you can apply tags, when certain events happen in your Marketing Automation tool, you are restricted to which events can be recorded on your website. Although AmbitionAlly and Memberium have an excellent feature set and offer some great tools for entrepreneurs they are rather restrictive and ‘closed’ to other plugins. It can be extremely alluring to learn about a product that does everything you need, seemingly saving you hours of time trying to snap together a variety of different plugins which may or may not play nice together. But this can come at a huge cost to the flexibility and needs of your business. You will be forever limited to the feature set of that particular plugin, despite the fact that other solutions may be far superior. WordPress is modular by its very nature, and using an ‘all-in-one’ plugin seems to go against the core of its philosophy. WPFusion also uses tags as the basis for content protection but it stands out from the rest because of its true interoperability. It’s the only plugin that gives you the choice of which membership, e-commerce, lead generation or LMS tool to use. WPFusion also integrates with 46 different plugins! This not only makes it easy to protect content with tags but also gives you a huge range of possibilities when it comes to applying tags which, quite honestly, seems to be a complete afterthought with the other plugins available. Apply a tag when a customer purchases an Event Ticket (using the Event Tickets plugin) which then grants them access to special hotel and travel deals. Apply a tag when a customer submits a quote request form (using Gravtiy Forms, Formiddable Forms or Contact Form 7) which conditionally grants access to a tailored set of services. Apply a tag when a customer marks a lesson as complete (using LearnDash , LifterLMS or many others) which unlocks a new course or lesson. Apply a tag when a customer purchases a product (using WooCommerce, Easy Digital Downloads or many others) and grant them access to a bbpress forum. Apply a tag when a achievement badge is earned (using GamiPress) which grants them access to exclusive video content. WPFusion offers content protection out-of-the-box, so you do not have to choose another Membership plugin, it’s totally up to you. For one year of updates and support, for one website, WPFusion is just $247! 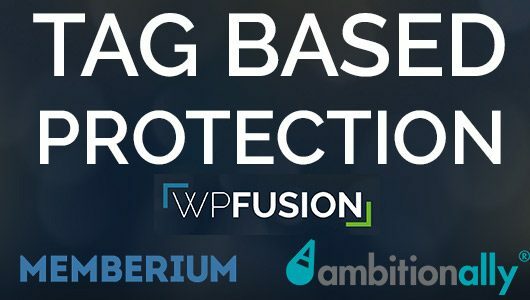 This means that if you accepts payments via WooCommerce (a free plugin) and use tag-based protection with WPFusion you can be up and running for under $250. Comparing this to Memberium ($470) or AccessAlly ($780) it’s practically a no-brainer! The flexibility of WPFusion makes it unrivaled in the ‘tag-based’ membership space and it truly stands on its own when it comes to freedom of choice and upholding the ideals of the WordPress ecosystem. So, if you want to use your custom combination of plugins and connect directly to your Marketing Automation tool of choice, WPFusion is the plugin for you. Choose your stack based on your business needs, not on the promises of some ‘all in one’ solution. Memberium – limited to only Infusionsoft , ActiveCampaign and a handful of plugins. Memberium uses ionCube technology which limits your choice of host, locks you into their platform and goes against the open-source philosophy of WordPress. AccessAlly – connects to Infusionsoft, ActiveCampaign, Drip, Ontraport, and ConvertKit. It offers an ‘all-in-one’ solution with tons of features but no plugin integrations and a very limited choice of payment gateways. WPFusion the only real contender, with 19 CRM/Marketing Automation connections and 46 plugin integrations. WPFusion is the choice for smart entrepreneurs who want power over their tech stack and unrivaled flexibility in their business.